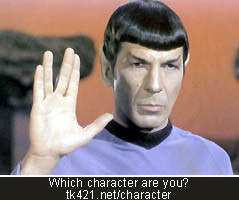 This is great: Which Fantasy/Sci Fi Character are you? ooh i have pointy ears! Okay, I was going to post my response on my page … but it said I was Luke Skywalker …. What?! *sigh* I’d rather have the pointy ears.